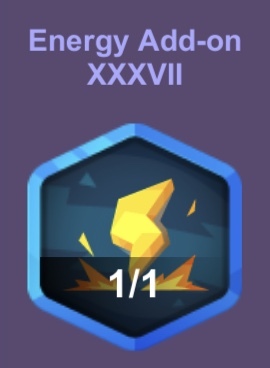 I just bought the xvii powerup, but my step to energy rate didn’t improve. The energy add-on powerups start at 10%, but additional ones get smaller. My add-ons are down to 1% now. That’s why you aren’t seeing 2.7. You can see a history of what each powerup gave you by clicking on the leftmost white arrows on the powerups screen. Update: I do see a problem with the description and now understand the source of your confusion. 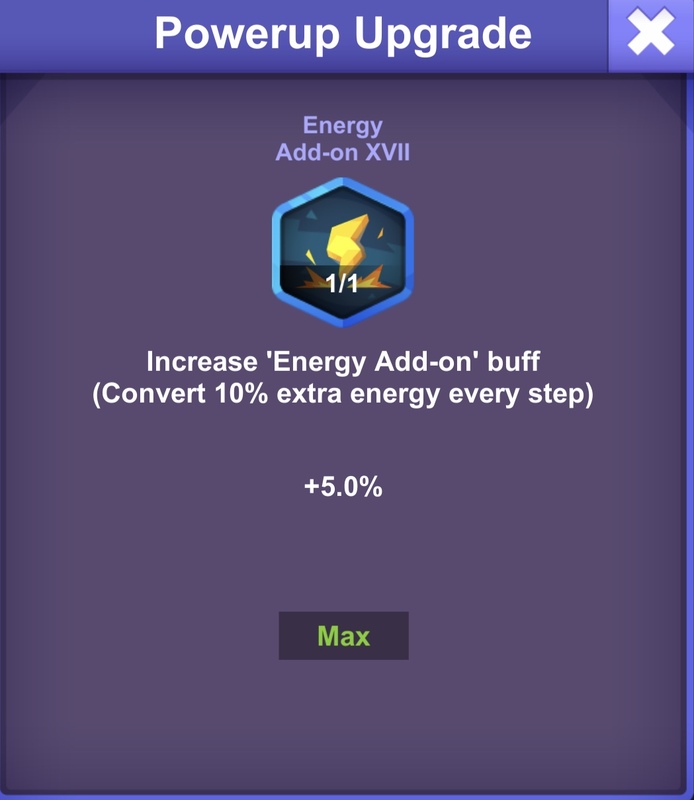 Says 10% inside the parentheses (for all the add-ons), but the actual amount awarded for your XVII powerup was only 5%. That’s definitely a description bug and needs to be fixed. Edit: Oh, right… Seems I got confused there, please ignore my post. I seem to also have a problem with powerups. 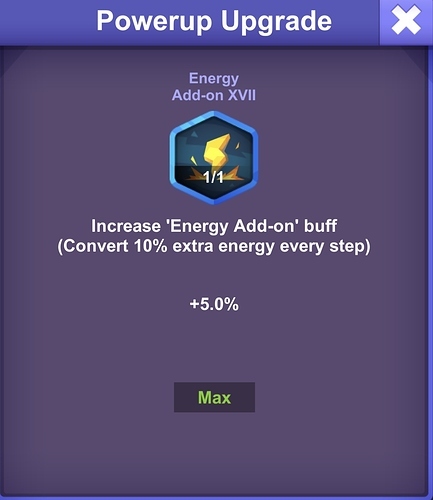 I got Energy Multiplier XI (+15%) and my conversion went from +375% to +390%. Then I got Energy Add-on XI (described as: +7%) and my conversion did not change. The energy add-ons increase how much energy each step is worth. The energy multiplier is a different bonus that’s applied to the first 10,000 steps you walk per day. 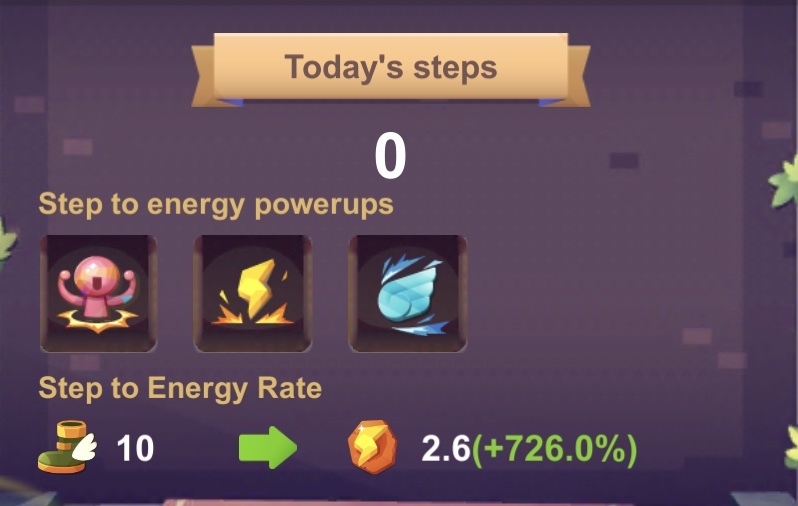 Energy add-on powerups increased my conversion rate to 2.6 energy per 10 steps. Energy multiplier powerups (and the SuperPass subscription) increased my bonus to 726%. I get roughly 2,600 energy per 10,000 steps (2.6 is a rounded number). I get about 19,000 additional energy for my first 10,000 steps, but only my first 10,000 steps. Here’s the exact math that’s used in your case. The description is definitely wrong and needs to be fixed. The first 3 powerups gave 0.1 each (10% of the base conversion rate), the next 3 gave 0.09 each (9% of the base conversion rate), and so on. Seems to eventually bottom out at 0.01 (1% of the base conversion rate), by the way. Also, what is the highest powerup you have of the rate conversion? How many more do I need to buy to get your conversion rate? That’s my most recent one (the 37th one), which brought me to 2.69 (actually shows 2.7 due to rounding) per 10 steps. I concentrate on doing the pet fragment and ancient rune stages over and over, so may be further along than most (if not all). Also didn’t hurt that I finished the story in hell difficulty rather quickly, so I’ve been churning out all 30 ancient runes per hour from resource generation (and have been diligent about collecting them before they hit max capacity and stop being produced). So, if you are looking to increase your conversion rate quickly, you’ll definitely want to advance through the story quickly. And in my opinion, I don’t think anything is faster than having two 6-star mages (and perhaps a priest and warrior/knight to help protect them).